Let’s Make it Possible is a not-for-profit entity founded, organised and managed by Palladium to provide direct financial support to innovative Positive Impact projects across the globe. The initiative delivers grants through three different windows: the Grant Challenge Fund, Our Communities Fund, and the Humanitarian Relief Fund. The second round winners of the Grant Challenge Fund were recently announced. Odyssey Sensors was one of the two LMIP Round Two winners. “Palladium has now contributed more than $1 million over the years to make powerful ideas possible in countries around the world” – Kim Bredhauer, Palladium Managing Director and CEO. Let’s Make it Possible (LMIP) is Palladium’s global platform to catalyse and support entrepreneurs, start-ups and innovative organisations. It enables us to advance the communities, economies and societies in which we work. Recently, applications closed for the Grant Challenge Fund. From a shortlist of five, we’re pleased to announce that two organisations have been selected: Sauti Africa and Odyssey Sensors. Over the next six to ten months, they will receive funding of up to USD $50,000 to support the implementation of their innovative ideas. As part of their winning application, Sauti Africa proposed a technology based solution to tackle informal cross-border trade issues in East Africa. Informal cross-border trade is a major feature of African economies: it creates jobs, contributes to food and energy security, and alleviates poverty. About 60% of cross-border trade is carried out by small-scale traders, and 70-80% of these are women. Small cross border traders are particularly vulnerable to higher levels of harassment from border officials (customs, police, and immigration), including excessive charges, bribe extortion, impounding of goods, sexual harassment and gender-based violence. Sauti Africa’s mobile-based solution aims to increase traders’ access to market and trading information, and help them trade safely, profitably and legally across East African borders. The mobile platform would ensure traders can better access tailored information on documentation, taxes and tariffs applicable to their products, as well as market and exchange rate information and regular updates on changes to border procedures. In addition, traders can use the platform to easily and anonymously report instances of bribery and harassment at border crossings. Data crowdsourced through the tool will be used in real time reports on incidents of harassment and bribery experienced at border crossings. These reports will be incorporated into evidence-based advocacy efforts by Sauti Afrca’s civil society partners. 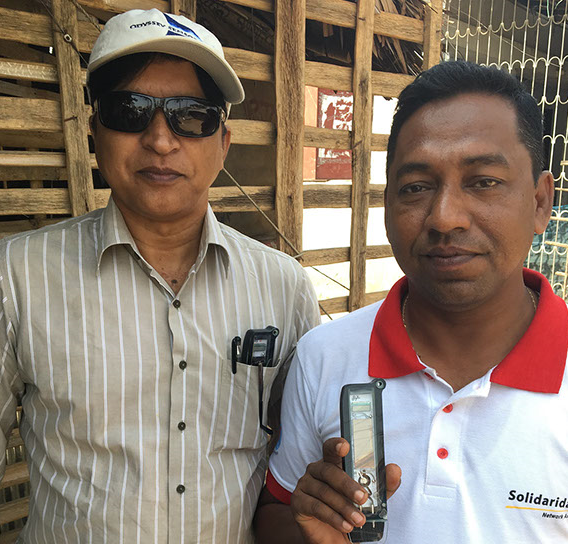 With an initial focus on Bangladesh, Odyssey Sensors has a plan to make life easier for the world’s 2.5 million shrimp farmers. In developing countries like Bangladesh, the negative impact of elevated water salinity on sustainable shrimp farming can mean the difference to an entire family’s wellbeing – nutrition, healthcare, and education. Further, from an environmental perspective, when salt concentrations in shrimp ponds remain exceedingly high for extended periods of time many shrimps will die. This forces farmers to abandon the ponds for new ones – often hacked from unspoiled mangrove forests. To better tackle this growing problem, Odyssey will pioneer a low-cost, solar-powered salinity sensor to increase smallholder shrimp farm productivity and the livelihoods of farmers and their families. Use of this salinity sensor represents a positive intervention aimed at disrupting the cycle of contamination, abandonment, and forest destruction. It also promotes economic opportunity for the overlooked and underserved smallholder aquaculture market. Congratulations to Sauti Africa and Odyssey Sensors, our round two winners!